Once a permanent tooth is knocked out, it is ideal that you visit a dentist immediately as prompt treatment can result in a successful tooth implant. 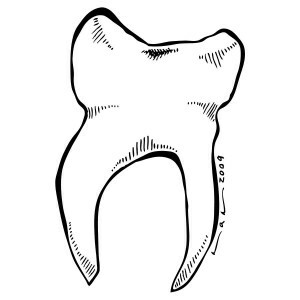 Tooth loss is often caused due to trauma by falls, assault and accidents. In young children, tooth loss is usually a result of thumb sucking, pacifiers, mouth breathing, poor oral hygiene and genetic factors. If you act quickly a broken tooth can be placed back in by a dentist. Ensure that you follow the guidelines posted on this page to increase your chances of success. Do not touch the roots of the tooth; only handle the tooth by the crown. Do not try to clean the tooth by rubbing off the debris from the enamel as this may damage the outer surface and lessen its chances of survival. Do not hold the tooth under running water. Wash it gently in a bowl of water. Try to place the tooth back in its socket. If the tooth does not fit in properly any more bite on a damp tea bag to hold it back in position. Allow the teeth to remain in the same position until you visit the dentist. If placing the tooth back in its socket is impractical, promptly replace it with milk, warm salt water solution or your own saliva. Do NOT handle the tooth by touching its root. Do NOT scrape or rub the tooth to remove debris. Keep the tooth moist by washing it and do NOT let it dry out. Do NOT hold the tooth under running water and only wash the tooth in a bowl of water for a couple of seconds. Wear a mouth guard while engaging in sports activities. Take care of your teeth and maintain good oral hygiene with regular flossing and brushing. Use an antiseptic mouth wash to rinse your mouth to preclude bacteria. In case of a gum disease, seek medical attention immediately. In order to prevent tooth loss and dental injuries, many sports consider wearing a mouth guard mandatory, especially contact sports such as boxing. Sportsmen are required to wear mouth guards at all times while training and competing in various sports activities. Professionally fitted mouth guards are not as uncomfortable as they may seem and even allow the user to talk and breathe properly. It is therefore advisable for children to wear mouth guards while playing as their teeth are susceptible to injuries during sports activities. Regardless of the fact that they possess milk teeth, a tooth loss should not be taken lightly as it may cause increased pain and difficulty while eating due to gaps. Ask your dentist to get a custom-made mouth guard fitted for you so that you do not feel uncomfortable while it is in your mouth. It is a good idea to talk to school coaches about making mouth guards a mandatory safety gear to ensure that your child wears one at all times while training ad playing. Check your child’s mouth guard every 12-18 mouths to ensure that it still fits well. Make sure the mouth guard is kept clean. Keep the mouth guard away from heat, in a container so that the customized shape of the mouth guard is retained. To learn more about how to manage emergencies such as accidental tooth loss take a St Mark James first aid course such as standard first aid. Visit our “locations” page for more information about finding a provider near you. Training providers are located throughout Canada in Toronto, Ottawa, Vancouver, Edmonton, Kelowna, Calgary, Halifax, Winnipeg and Regina.